Implementation of local governments’ investment projects depends on their ability to raise necessary funds from a combination of own resources and external financing. Debt financing enables municipalities to carry out more infrastructure projects in a shorter time period as compared to the financing from own funds. However, the risks associated to borrowing have to be well understood and documented in terms of their potential impact on local budget in the future. 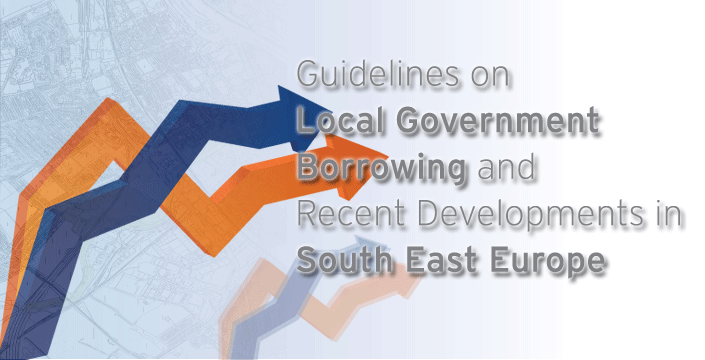 This website is an e-learning tool covering the topic of local government borrowing tailored for the needs of the local authorities in South East Europe. The website is based on a Guide prepared under the NALAS Task Force on Fiscal Decentralization, which can also be downloaded as an electronic book, or purchased as a book. Please use the links on the left to learn about local government borrowing. If you are new to the subject, then going sequentially over each link will give you a thorough explanation. However, if you are coming with a specific issue, or question, then please visit the forum, where you can ask questions, or read previous discussion. A team of experts involved with the project monitor the forum and should be able to respond to your requests. To download the Guide to an e-book reader, please click here. This service is provided by Google Books. To download the Guide in Portable Data Format, please click here. The Guide is also available in languages spoken in South East Europe - click here to download localized versions. Please give feedback on the Guide and this website. To download a feedback form, please click here.. The Guide is a result of a joint work of local and regional experts managed by the Romanian Association of Communes. To read more about the expert team, please click here.